I was working in Hong Kong and Vietnam is only a 2-3 hour plane ride away, so we managed to wangle 2 weeks there. Nothing could have prepared me before experiencing Vietnam. There is amazing scenery and beauty but also immense poverty in some areas and overall a completely different way of life to the UK. Vietnam is very beautiful and the scenery is different, but equally astounding, from North to South. 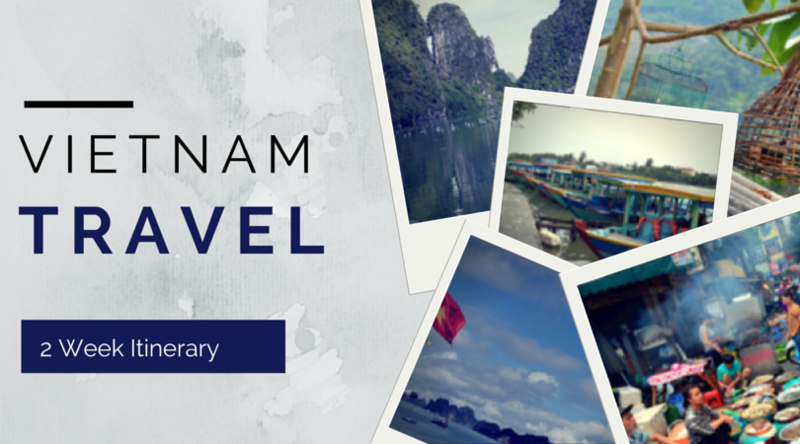 Vietnam has a lot of different types of things to do, from trekking in the mountains of SaPa to cruising on a boat along the Mekong Delta. I have read a lot about Vietnam and people seem quite divided on whether they love or hate travelling there. I certainly think it is a place you should go to on your travels and make your mind up yourself, so don’t discount a place because you have read a bad review online. Hanoi was crazy, there’s a combination of mad traffic with incessant honking of moped horns and a mass of people packed into a small space, it is definitely not a place to relax but there are lots of things to see and lots of amazing food. We had the best street food in Hanoi, the barbecued chicken and rice with a spicy citrus dipping sauce just on the corner of the road near our hotel (Hanoi Golden Palace), some amazing fresh custard filled doughnuts which were made at the side of the road near the market, Banh My (Vietnamese sandwich) and much more. Don’t be afraid to try street food, they have no refrigeration facilities so the food is often much fresher than in a restaurant as they have to get the ingredients from the market then cook them right away. As for tourist sights, there is Hoan Kiem lake, the market, the backpacker area, and the amazing Water Puppet Show which is an absolute must-do, we visited the Ho Chi Minh Mausoleum and the temple of literature (above) which was an oasis of calm in contrast to the rest of the city. I was so excited to see Halong Bay and it’s somewhere you really need to try and go if you travel to Vietnam. Witnessing the amazing natural rock formations and calming waters makes it feel a world away from the hustle of Hanoi. I felt so peaceful as we glided along the waters and the people on our tour were so nice and chatty, it was great to get to know them over a beer in the evening so I recommend doing an overnight trip on one of the boats. Others did 1 night in Halong Bay and 1 in Cat Ba island which is the only island with the monkeys that live on the rocks, so if you have time I recommend that too but unfortunately we didn’t. Make sure your return transfer to and from Hanoi is included in the price or they will add on an extra amount just before you have to leave (they did this to us) and it slightly tainted the start of the trip, as being ripped off will do! Also be aware that this is a tourist destination and it is very touristy, there are people selling things everywhere, perhaps Cat Ba island is more serene. We travelled from Halong Bay to Hanoi via bus then went to the train station to catch an overnight train from Hanoi to Lao Cai which is near Sa Pa, you then get a bus from Lao Cai to Sa Pa, I recommend booking this here Sapa Sisters train page , we had no problems at all. We went with the Pumpkin Express train which was clean and lovely, after many horror stories about Vietnamese trains I was surprised to find it so nice, even our bunk bed covers were clean and fresh. People on the train seemed lovely and friendly (those that I met anyway)! 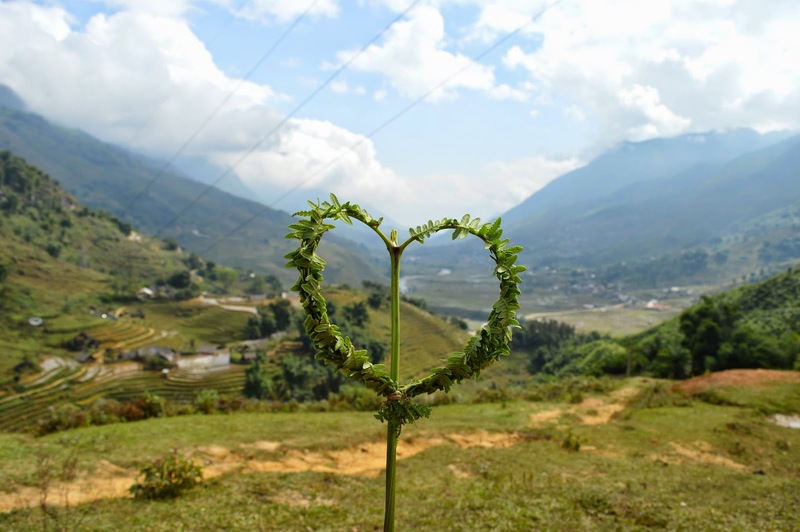 We trekked with Sapa Sisters as I wanted to support the local women, it was the only trekking group I could find where the money was given directly to the guide, and was run only by the Humong women. Our guide Ker was so lovely, and must have such a tough life. It was definitely an eye opener and an experience that I will not forget just seeing her home and the hard work she has to do every day to feed and look after her family. The mountainside town of Sa Pa is beautiful and peaceful and we spent two days trekking through the mountains with our guide Ker who is of the Humong tribe who live in the mountains, we stayed in a homestay overnight and visited Ker’s family on the second day. We trekked for 5+ hours each day over waterfalls, through bamboo forests, up and down surfaces so slippery I thought it impossible we could even get up or down them and at one point what seemed to be just vertical mud. It was so hot and I’d never trekked before. I’ll be honest with you, it was much harder than I was expecting and pretty exhausting, but I am glad to have accomplished it so I could see the tribes living in the mountains and the beautiful scenery, but perhaps going on a motorbike would be a good alternative! Da Nang (We got the overnight train from Sa Pa/Lau Cai to Hanoi, then a cab from the station to the airport and flew to Da Nang with VietJet (who were really good), and it was cheaper and quicker than the train. Once we got to Da Nang we got a taxi straight to Hue. My friend Sallie had travelled to Vietnam and suggested we go to the Imperial City of Hue as they hadn’t had time, so we made time to spend 1 day there. For over 100 years Vietnam was ruled by the Nguyen Dynasty and it’s capital was Hue. We visited the Imperial Citadel where the Emperors lived and worked and walked around the Forbidden Purple City inside the Citadel, where only the most important people would have been allowed to go. Sadly, a lot of the Citadel has been damaged, firstly by the French and then the Americans during the wars, but it is still beautiful and worth visiting, and restoration works are slowly being done. There are many other things to do such as taking a cruise down the Perfume River, visiting the Thien Mu Pagoda and some Imperial Tombs however we didn’t have time. If you are time-short, I recommend getting a motorbike tour of the city, which we probably should have done. Just arrange a good price before you get on the bike! We got a bus from Hue to Hoi An that cost just $5 each! We were so surprised at the price. Hoi An is easily my favourite place in Vietnam. I have such lovely memories of being here and feeling so free and relaxed. The whole place is a Unesco world heritage site, so you don’t have to go very far to see the sights! You can buy a ticket and visit a number of different sites under that system and just paying for the one ticket, which is quite handy. And don’t let anyone tell you the Japanese bridge requires payment, it’s free! We stayed in a beautiful hotel called Ha An which I booked because of the suggestion here. A massive thank you to the lady that wrote this, as we loved the hotel so much. Hoi An was the most beautiful place outside of Sa Pa in Vietnam to me, the people were so relaxed and cheerful, the hotels were more beautiful, everything was colourful from the buildings to the scenery and I felt truly happy and at peace. Hoi An is the only place in Vietnam where the businesses are required to hang paper lanterns outside of their shops and restaurants in the evenings and it creates a lovely atmosphere, even when we were in a random outdoor nightclub by the river blasting Pitbull it looked beautiful. From the brightly painted pagodas and boats to the tailors shops where Pete got some lovely boots made, I felt a much more chilled out vibe than the rest of Vietnam. 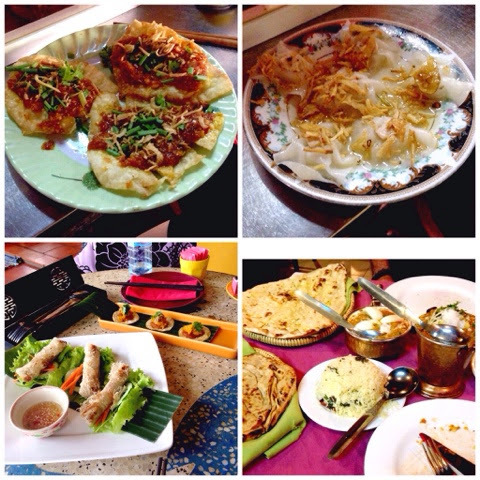 I had some amazing food in Hoi An, I was very spoilt. In the markets we tried white rose (dumplings) and fried wontons (pictured above) we had a delicious authentic North Indian curry in Ganesh restaurant, tried (and made ourselves) some brilliant dishes at Morning Glory cooking school – review here , visited Mango Mango for some delicious cocktails and sweet potato pancakes, tried Hoi An speciality Cau Lau and some delicious squid at Blue Dragon restaurant overlooking the river that gives a portion of it’s profits to the Blue Dragon charity. We borrowed bicycles from our hotel and cycled to the beach and back which was so lovely, I was too scared to cycle anywhere else in Vietnam as the traffic is scary but here it was much safer. The beach is beautiful and peaceful and a lovely expanse of sand had me prancing about as the tide came in as I felt so carefree. We got some shoes made at Hue Kiem the ladies were such nice and friendly people and the shoes are top quality. You can take a picture of something and they make something very similar within 24 hours, ours for just £37 for handmade fully leather shoes. My treat to myself was to go to one of the spas down the same road as our hotel, I had a pedicure and my eyebrows threaded for just £6. The service was amazing and the people so friendly, I definitely needed a pedicure after all of the walking around we had done. If I had more time I would have had a massage as they were so well priced. I’d heard a lot about Ho Chi Minh being ‘the’ place for food in Vietnam, but sadly we didn’t find many great places. The best food seemed to be given to locals and either, such as at the street food stands, they refused to speak to us and ignored us (until a really nice guy called Eddy, also a tourist, took pity on us and ordered in Vietnamese for me and I subsequently had some delicious grilled octopus) or they refused to accept just pointing at the food and saying 1 or 2 portions, they usually just shrugged or shook their head. In the restaurants the food we had was ok, and I had a hot pot which sort of cooked itself, but it was nowhere near as good, in my opinion, as Hanoi or Hoi An. I recommend looking on line for some specific recommendations before you go there, for nice places to eat, so you aren’t disappointed. We went sightseeing and I saw the Saigon Notre-Dame Basilica which was built by the French colonists, the Central Post Office, the Opera House and the Reunification Palace. We went on a half day trip to the Cu Chi tunnels, where the Viet Cong soldiers hid during the Vietnam war and had a full day trip to the Mekong Delta. On our last full day in Ho Chi Minh I hired a cyclo in the morning and I was peddled around for about half an hour, just to see some of the sights. It was a great way to be able to actually look around as you can’t do that when you are walking as the traffic is so crazy, you really have to keep an eye on the roads and the bikes. I recommend this and found it really fun. You shouldn’t expect to pay more than 50,000 dong for an hour though according to our hotel, I paid that for half an hour but I didn’t mind, it was about £1.20 and lugging me around for half an hour would have been pretty tiring. 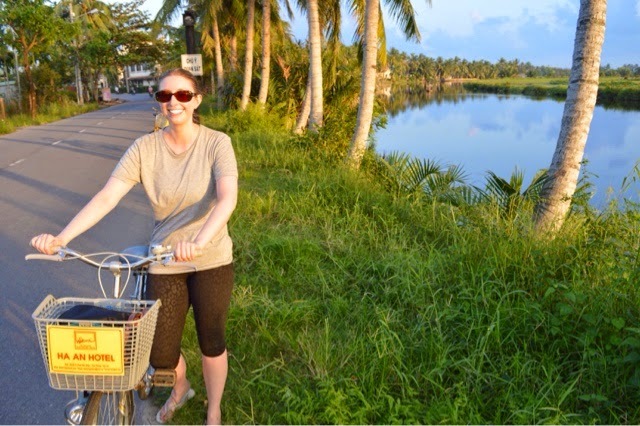 When we arrived at the Mekong Delta I felt like I was truly seeing Vietnam. The Mekong is in the south west of Vietnam it travels down from Tibet and finally reaches the sea once it passes through Vietnam. There are networks of streams that come off the river and we went down one on a small boat to visit a local house and the areas where they keep bees and make coconut candy. It was quite touristy but when we were on the boat gliding along past the beautiful scenery it was so lovely. We saw a true floating market for locals where farmers go to sell their crops and many houses built alongside the river on stilts. I did at one point mention that travelling along in the small boat with all of the lush vegetation to each side, I felt like crocodile dundee! Haha, well I did! We went on an all inclusive tour as independent travel is quite difficult to come across, this does mean that you have to do as you’re told and follow a set timed itinerary, see what the specific tour offers you as they can vary, some visited orchards and temples whereas we visited a local house, the floating market, coconut candy factory and somewhere where they kept bees and made many different honey and royal jelly products. We saw them making things from the coconut water, milk, flesh etc. they don’t waste anything. While it was quite touristy to go and see the coconut candy factory I did find it interesting, they still use such primitive machines and everything is done by hand, it looked to be exhausting work. You could take a trip which included then going on to Cambodia or stay in a homestay overnight, it just depends how long you have. 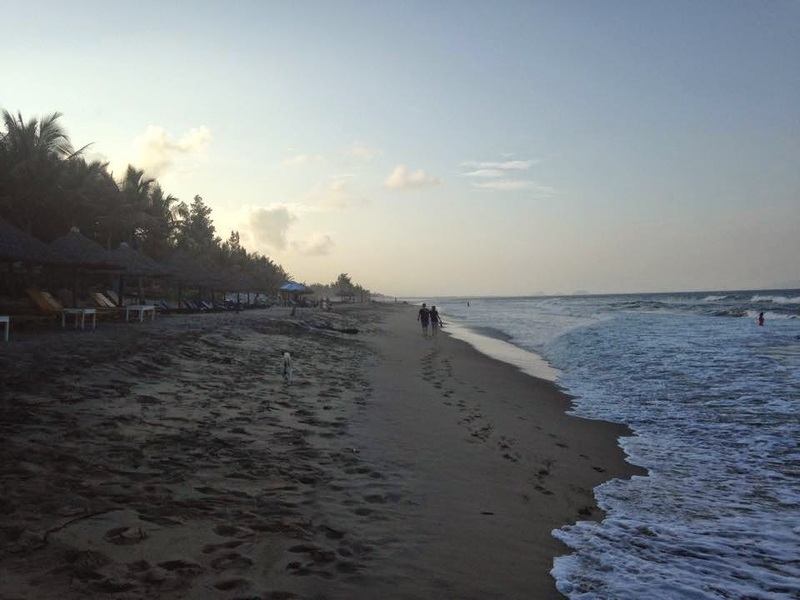 If you have time to visit Phu Quoc island we were told by many people that it is definitely worth it, it is a few kilometres from southern Cambodia, much like a tropical paradise. Perhaps next time! I had an amazing time in Vietnam, I hope you do too.